The new norms allowing use of mobile phones for making calls and internet surfing during flights in the Indian airspace could come as early as January, after the Law Ministry gives its concurrence, Telecom Minister Manoj Sinha said on Wednesday. The Telecom Ministry is currently awaiting the views of the Law Ministry on in-flight connectivity rules and is hopeful of notifying the norms soon thereafter, Sinha said. On May 1, the Telecom Commission - the highest policy-making body of Department of Telecom - had cleared a proposal for allowing wider in-flight connectivity that is now available in most of the developed markets. People will soon be able to withdraw cash from ATMs by scanning a QR code on the machine's screen instead of swiping a card, by the means of a Unified Payments Interface (UPI) based solution. AGS Transact Technologies, a company which provides ATM services to banks, has developed a system that uses UPI platform to dispense cash from ATMs, according to a Times of India report. The bank account holder only has to subscribe to a mobile application that comes with UPI capabilities to facilitate a payment through ATMs. Indian cricket team captain Virat Kohli has been named the richest sportsperson in the country. In fact, he sits second on the 2018 Forbes India Celebrity 100 List rankings, right behind Bollywood superstar Salman Khan. 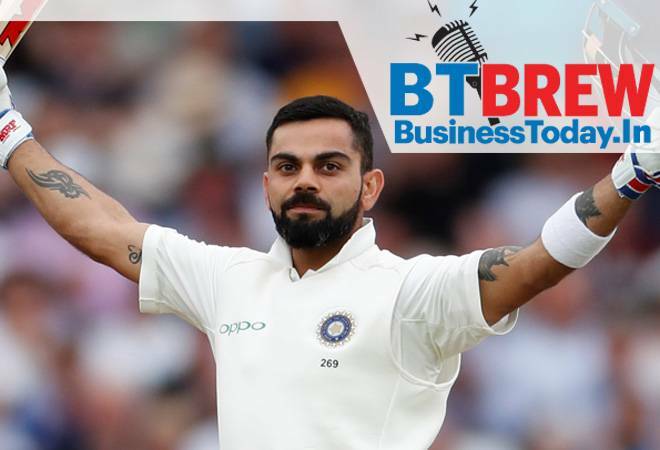 Though his standing hasn't changed since the 2017 rankings, the 30-year-old skipper's earnings more than doubled year-on-year to a whopping Rs 228.09 crore. The finance ministry Wednesday said the assessment of growth and inflation made by the RBI's Monetary Policy Committee (MPC) is in line with government's reading. The government, he said, welcomes the assessment made by the MPC. The RBI has also decided to reduce Statutory Liquidity Ratio or portion of funds banks have to mandatorily park in government securities from existing 19.5 per cent to 18 per cent in six quarterly instalments beginning January 2019. Facebook Inc let some companies, including Netflix and Airbnb, access users' lists of friends after it cut off that data for most other apps around 2015, according to documents released on Wednesday by a British lawmaker investigating fake news and social media. The 223 pages of internal communication from 2012 to 2015 between high-level employees, including founder and Chief Executive Mark Zuckerberg, provide new evidence of previously aired contentions that Facebook has picked favourites and engaged in anti-competitive behaviour.The documents show that Facebook tracked growth of competitors and denied them access to user data available to others.